Size of this preview: 530 × 351 pixels. 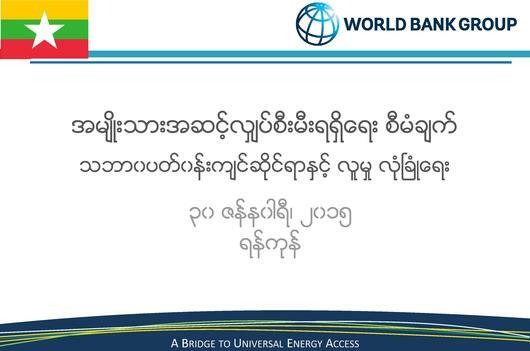 English: On January 30, 2015 in Yangon, the WB held a consultative meeting with civil-society organizations to share information on NEP preparation. Approximately 40 people participated including local and international civil-societies, business and media as well as MOEP and DRD PMO staff responsible for safeguards. World Bank Country Manager Mr Abdoulaye Seck made opening remarks, Senior Energy Specialist Dr Xiaoping Wang gave an overview of NEP preparations, and Senior Social Safeguards Specialist Mr Svend Jensby described safeguards requirement. This page was last modified on 27 February 2015, at 09:40.